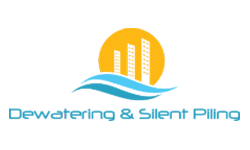 Dewatering & Silent Piling was founded with the intention to create a company that is specialized in the dewatering field, more precisely drainage and temporary lowering of the aquiferous layer in every hydrogeological condition, also operating in a range of piling services. The attention paid to the organization and management of different services and different types of intervention, allows Dewatering & Piling Silent to perform various types of interventions, private, industrial, public and civil. Dewatering & Piling Silent has at its disposal equipment that allows to face any drainage work in any type of terrain, with technical staff of excellent value, working daily with technical consultancy firms and engineers on job sites, in order to best solve all the problems that arise from time to time during the implementation phase of an excavation in the presence of groundwater.